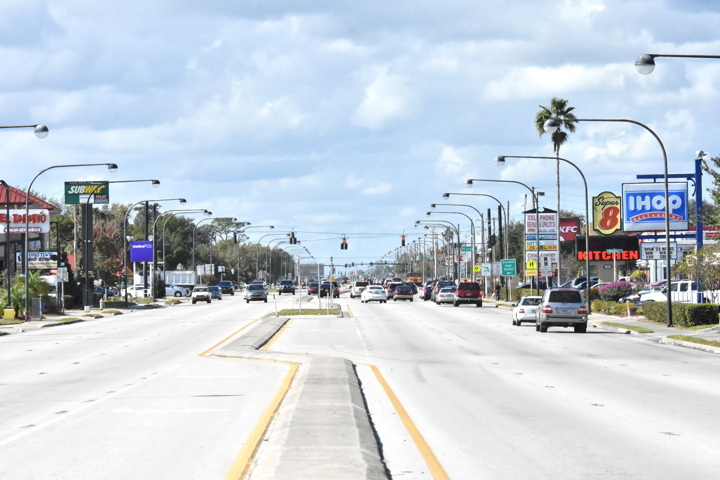 Highway 192 is a pretty touristy main drag running just south of the Disney World property, and straight through the neighboring town of Kissimmee. There is just something about that name that sticks in your head. Even as a child I remember numerous vacations staying at a Howard Johnson in Kissimmee as we never stayed on Disney property. Coming down from Canada, as much as we wanted to spend an entire week at the parks, there was just so much more to do in Florida we had to keep moving. But Kissimmee was a name I never forgot. Now that we are down in Florida we have slowly been trying to find our way around and go further and further from our house to see what’s out there. I will admit up front that I have been checking pennycollector.com to try to collect some new coins around town, but there’s been so much to do with the new house that I don’t have as much time as I want to go on penny collecting trips. 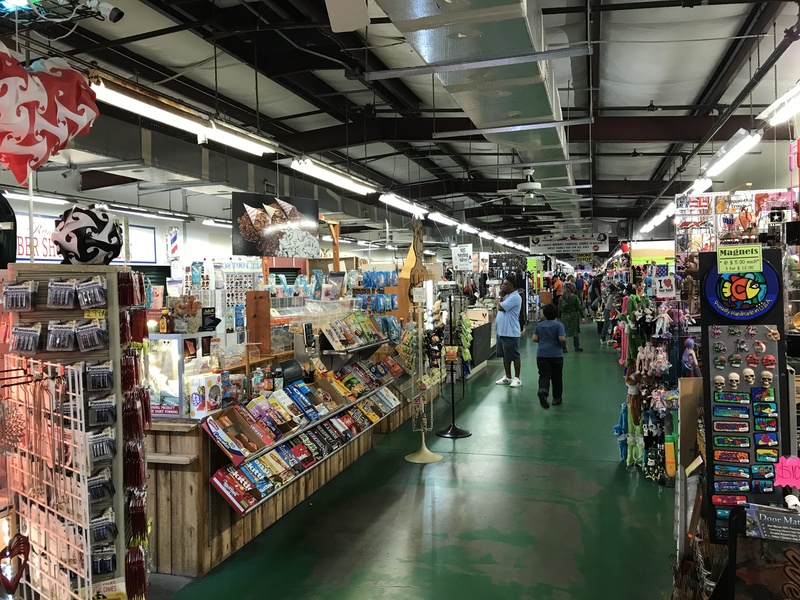 This past weekend I had some errands to run and the stores I needed to head to just happened to be in Kissimmee right along Highway 192. This is where I knew there were some penny machines I needed to check out. The Main Gate Flea Market was one of these stops. It’s right along Highway 192 surrounded by Hotels and over the top souvenir shops. 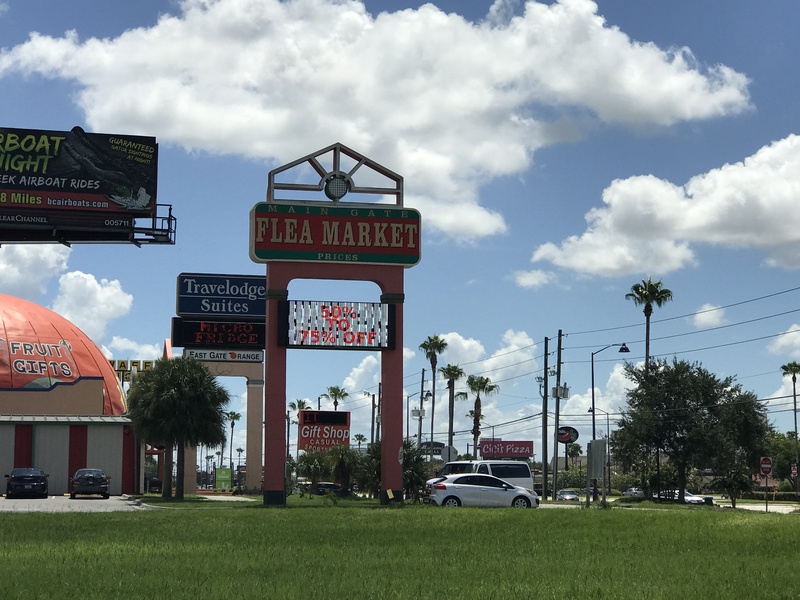 The flea market consists of two buildings A and B. Both are very similar just obviously with different vendors in each. 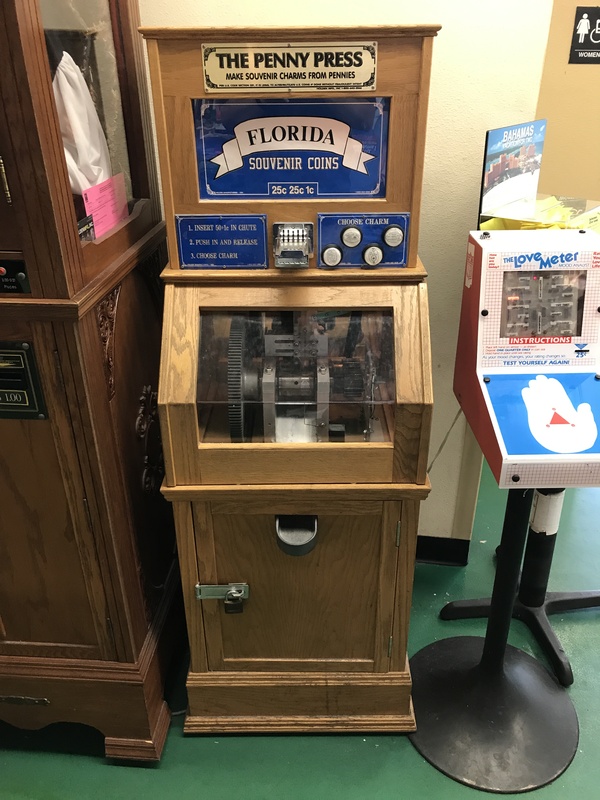 We really weren’t looking for anything specific, and really was just here for the penny machine but I figured we may as well see what’s available. We headed into Building A to start walking around. There are a few kiosks with boiled peanuts, and “fresh” made candy, but most of the other stuff is the classic souvenir items. 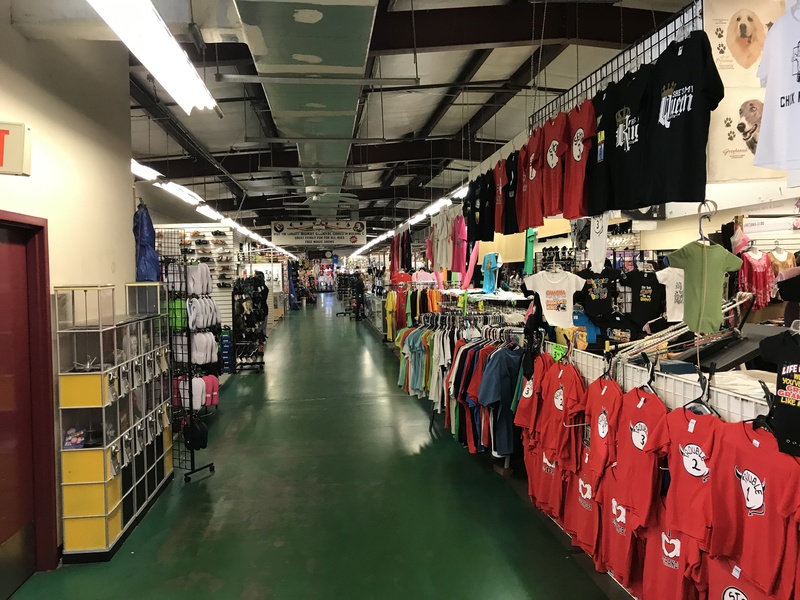 T-Shirts as far as the eye can see, snow globes, orange tree starter kits and tons of cheap sunglasses and umbrellas as must for Florida visitors. Down one of the aisles we found the restrooms and for some reason the penny machine was located. I guess this ensures a lot of traffic past the machine but who knows. This was an interesting machine. It was an electric model but in a very dates looking cabinet. But I don’t mean it was beat up, rather just looked kind of link an antique which was pretty cool. The designs here are ones I’m sure I’ll get used to seeing throughout Florida. These seem very similar to ones I used to find along the Jersey Turnpike or other roadside rest stops. 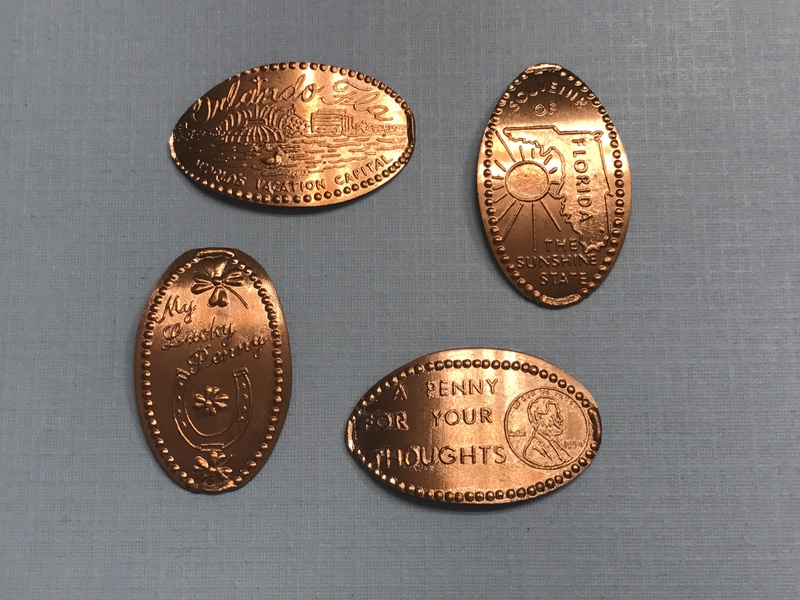 The designs included Orlando FL – World’s Vacation Center, Souvenir of Florida The Sunshine State, My Lucky Penny with Horseshoe & Shamrocks, and A Penny For Your Thoughts. With the pennies safely stowed away we finished walking around the Flea Market but didn’t buy anything this time. As much as I say the stuff is pretty standard it’s still hard to resist some of it. This was a nice little stop and they do have some cheap souvenirs if that’s what you’re looking for. Plus the pressed pennies are some of the cheapest souvenirs you can get, and will last a lot longer than the knockoff Mickey plush. Click here to see my YouTube channel video on these new designs.